Risotto is a Northern Italian dish of rice cooked in stock from vegetables or meat. 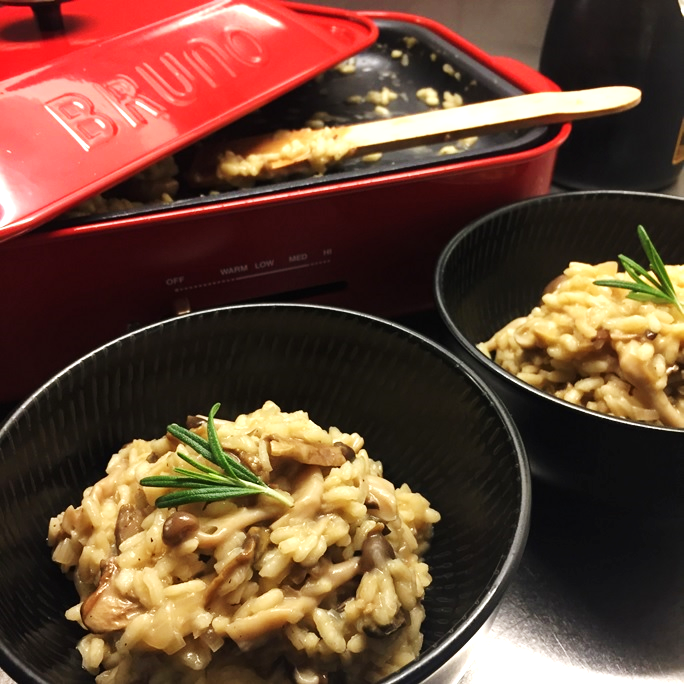 This creamy and rich dish can be made using the Bruno Hotplate. Learn how to cook this humble dish right now! Bring chicken stock to a simmer and keep warm. Preheat Bruno Hotplate on medium heat, add 1 tbsp olive oil. Add onions and rehydrated porcini, stir-fry for a few minutes, do not brown. Add fresh thyme and rice. Mix well. Turn the up to med-high, add fresh mushrooms and white wine. Let it sizzle for a bit. Lower heat to low-med, add a ladleful of stock and mix frequently until the stock is absorbed. Add another ladleful of stock and repeat until rice is cooked (around 15-20 minutes). Taste and season with adequate amount of salt and pepper. When rice is cooked and is still a little runny, turn off the heat. Quickly toss and stir in grated cheese and butter, to stop the cooking process. Plate up and serve immediately. Grate more cheese on top if you like. If you have leftover risotto, store them in the fridge. You can mould them into balls and grill them on Bruno Takoyaki Hotplate the next day for a quick snack.